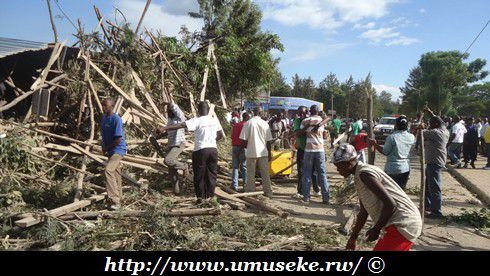 The Rwanda Housing Authority (RHA) yesterday announced that it had set up a technical team to investigate the cause of the building which collapsed in Nyagatare District, Eastern Province, killing six people and injuring 30 others on Tuesday. According to RHA officials, the nine-member team, led by Haruna Nshimiyimana, the housing authority legal adviser, is expected to produce a report within a week. Others on the team are an RHA engineer, two police officers, military engineer, an employee with the Ministry for Disaster Preparedness and Refugee Affairs, two district staff from land bureau and a provincial staff in charge of quality assurance. “The report will help us to take strong measures to avoid more man made disasters of this nature,” Esther Mutamba, the director general of RHA told The New Times yesterday. Mutamba urged the public and districts’ One Stop Centres to “strictly follow the construction permit application guideline sent to them” before authorising construction. Meanwhile, the Association of Architects and Engineers in Rwanda said technical and professional requirements were ignored in the construction of the four-storey structure.